VISPRONET® – personalise, advertise & print directly online! From 19.04.2019 (Good Friday) to 22.04.2019 (Easter Monday) our company will be closed for holidays, therefore all orders & delivery times will change accordingly. We wish you a Happy Easter! Create your own personal motive in just a few steps and without any graphic knowledge in Visprodesign®. 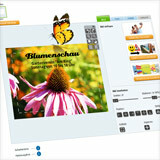 There are numerous, free design templates, cliparts and photos which you can combine with your own pictures and texts. Ready-made easter products for decorating, advertising and giving away. Fill in your own logos, photos and texts. Put your most beautiful memories in style. Select your desired product and then browse the "Cliparts and Photos" in the Visprodesign®. There are numerous, free photos for every occasion. Which is your favorite motive? The online printing company Vispronet® offers broad spectrum of individualized products for private and business customers. Take advantage of the latest digital and screen printing technology and over 28 years of market experience. The online-printing company Vispronet® stands for an excellent quality standard combined with an impressive vertical range of manufacture and a huge output. 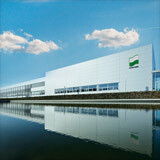 You are guaranteed shortest lead times as well as quick and safe delivery on more than 30,000 m² production area. We provide you with appropriate accessories for every product, whether flag, flagpole, exhibition system or promotional parasol. If you are unsure about the material selection, you can also request for free sample materials from Vispronet®. Plan and design with us your perfect advertising appearance or an inventive gift idea. A multitude of possibilities around ordering, service and dispatch to more than 34 countries make it especially convenient to shop online at Vispronet®. By the way: many products can be delivered with Express or Overnight service. In order to make customer advice as professional and personal as possible, a live chat is active between 9:00 am and 6:00 pm (Central European Time) on working days. You can also contact us via our hotline +49 3578 359-4141. Every appearance, whether business or private, should leave a lasting impression with partners, guests and friends. The product range of the online-printing company Vispronet® provides you with multi-faced solutions for an individual presentation. Bowflag®, fabric banners, Roll Ups, flags or exhibition walls – the internet printing company Vispronet.eu is your specialist for the production of advertising textiles and other materials. We guarantee you a high variety of products and numerous creative ideas for unique design. Embed a logo or your favorite image on products such as parasols, posters or advertising signs of our online-printing company. Develop creative eyecatchers for promotion or decoration. You will discover attractive gift and decoration ideas also for private use in our product portfolio. Make stunningly beautiful gifts with table displays, canvas prints and personalized seating units or decorate your living area in an original way with custom clocks and aesthetic posters on acrylic panel. Explore the diversity of print products in the Vispronet® print shop and take advantage of your possibilities! A special service of our online-printing company Vispronet® is the free design tool Visprodesign®. It helps you to implement your creative ideas quickly and easily. Develop a wonderful design with our free cliparts, photos and templates. You do not need any special graphical knowledge. Let yourself be convinced of first-class quality. Vispronet® makes online shopping an experience! With just a few clicks, you get exceptional birthday presents, funny surprises for Easter, Christmas or enrollment, or very special gifts for customers and business partners. You can easily design your own product with our design tool Visprodesign®. It is not necessary to be a graphically skilled person for that. Upload your own photos and combine them with text or use our numerous free design templates or cliparts for your design. Whether coloured or black and white, with images or just text, you can materialize your motif according to your individual visions. Let your imagination run free! Design for instance your bean bag on front and rear side with equal or different images according to your ideas. Our online-printing company Vispronet® offers a wide range of products in particular to companies and service providers. The selection ranges from large format PVC-Banners to small flags. In our assortment you can look forward to an extensive selection of different advertising products. We print for your indoor and outdoor promotion, for example, sturdy posters, advertising signs, flags and banners exactly according to your needs. Posters made of paper are not characterized by a long lifespan in many cases. In this respect, the advertising products from Vispronet® which are made from resistant materials such as various textiles, Poster on Aluminum Panel or Poster on Foamcore have a lot over traditional posters. 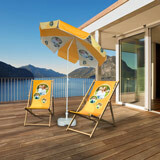 Let yourself be impressed by the high print quality and durability of your advertising products! Make your conference or trade show presentation to a sovereign performance. 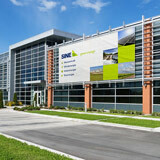 Design a display system, a unique Bowflag® or a Roll Up with appealing sales messages. Your own company logo and images of your latest products can be placed so simply and prominently inside or outside. Excite your customers with an interesting and at the same time promotionally effective shop equipment. Stand out from the other competitors and score with individuality. The stable and flexible trade show systems from Vispronet® guarantee a successful and professional trade show appearance! Exhibition stands in all sizes can be designed with diverse systems: from a easy display for presentations at the POS to larger, curved exhibition walls with plenty of space. Comprehensive accessories such as brochure stands for flyers and information material, promotion counter and info boards round off the range offered by Vispronet®. 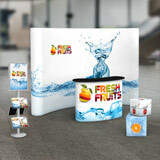 Assemble your individual trade show stand. Whether for room decoration, as advertising or for events and trade shows, the online-printing company Vispronet® offers you a wide range of products in the field of flags. Our products, as for example flags in front of a company building or attractive club flags, achieve highly representative effects and decorate both the interior and exterior. You can also rely on highest quality when ordering double-sided flags, special flags, street banners and Bunting with Pennants from Vispronet®. Our range of flag products stand out due to high resilience, long durability and particularly vivid colours. We achieve this by processing high-quality materials and brilliant printing processes. Convince yourself! Behind the heading „Living & Lifestyle" you will find lots of original ideas for room design, decoration or creative gifts for many occasions. Vispronet® offers cube seats and cylinders, bean bags, table cloths, fabric covers, folding furniture or sledges – all with your individual design. You will also find the canvas print with frame in square format as original decoration element and highlight for your home or office in the poster section. Or simply develop yourself extraordinary designs for wallpapers. Explore calmly the extensive product range offered by the Vispronet® print shop and be inspired by many unusual print products! Vispronet® offers a huge product diversity. The category World of Themes combines for you a lot of photo gift ideas for Easter, Christmas or wedding. But there are also numerous, creative suggestions for the decoration of electoral events, carnival parades or sports events. Start your discovery trip! Here you will find the most popular Visprodesign®-templates for some selected articles already preconfigured and pooled in our selection of ready designs. There are, for example, original seat cushions in different styles. You just have to click the design, put it into the cart and buy it. It goes without saying that all of the listed products can be easily supplemented by free cliparts and photos, or own pictures and great texts. Save your time and use a ready design. Enjoy browsing! With the large number of different materials in the Vispronet® print shop, it is difficult to maintain an overview. In order to make the right decision which material suits best for you, for the intended purpose or for your design, you have the possibility to request here different material samples. You can choose between free sample materials unprinted as well as printed sample books.